Air Conditioning from Stafford Mechanical Services, Inc. When you need comprehensive air conditioning services for your home, you can count on Stafford Mechanical Services, Inc. to assist you. At Stafford, we offer the best AC products and services. You can trust us to provide you with equipment from today’s premier manufacturers. And, you can trust our licensed and trained technicians to service your air conditioning equipment professionally and efficiently. We strive to ensure complete customer satisfaction on every job we do, and we work hard to meet your every need. Choose Stafford for all of your air conditioning needs. AC Maintenance: Did you know that one of the best ways you can ensure maximum efficiency and effectiveness from your air conditioning system is by getting annual air conditioning maintenance? At Stafford, our technicians provide expert AC maintenance, so you can enjoy optimal cooling this summer, and for many summers to come. AC Repair: Nobody wants to think about their air conditioning system breaking down during a heat wave, but if it happens to you, you can trust Stafford to help. We offer 24-hour emergency repair services for our customers. You’ll get expert repairs on your equipment, so you and your family can go back to enjoying cool comfort as quickly as possible. New AC Installations: Do you need a new air conditioning system for your home? Then you should know you can count on Stafford to provide you with a new AC installation. 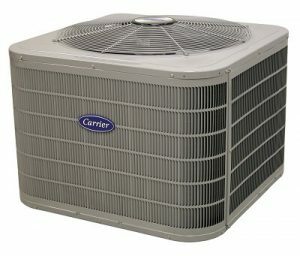 As a Carrier® Factory Authorized Dealer, you can trust us to provide you with high-quality, high-efficiency air conditioning systems for your home. What’s more, our technicians are licensed and trained to meet all of your cooling needs. Ductless AC: If you have a room in your home that could use some cool comfort, but where access to ductwork is impossible or impractical, then why not consider ductless AC from Stafford? We install and service ductless air conditioning systems, so you can make use of every room in your home this summer – no matter how hot it gets outside! Geothermal AC: For incredibly efficient cooling for your home, geothermal air conditioning is the right choice. Your geothermal AC works by absorbing the heat from your home, transferring it underground where the cooler earth absorbs it. Then, the cool water is used by the heat pump to make cool, dehumidified air for your home. Operating costs for geothermal AC are significantly less than traditional fossil-fuel systems. When you need air conditioning products and services for your home, count on Stafford Mechanical Services, Inc. to assist you with your Carrier AC or any other brand. You may contact us via phone at (860) 684-9485. We look forward to helping you with all of your air conditioning needs.